At NYCC 2016 I had the opportunity to play the latest video game entry in the Sword Art Online series, Sword Art Online: Hollow Realization. The PS4 version of the demo was playable at the Bandai Namco Entertainment booth at the convention. The demo takes place early on in the game against a boss called Weiss the Kobold Lord. In this demo you control Kirito and have a party that consists of Asuna, Leafa, and Strea. Before stepping into the boss area, the other parties give you information that they gathered on the boss. For example, for the Kobold Lord they tell you of how it has a wide AoE (Area of Effect) attack that takes out a large chunk of your HP. Before you start the fight, the game advises you on how to tackle the boss. It tells you to first take out the boss’ legs so that it kneels down. Once this is done, the large red gem on its chest can be easily attacked. This is where most of the damage is done to the boss. If you took too long to take out the leg of the boss, the other one would regenerate so you had to be quick with your attacks. The game plays very similarly to Sword Art Online: Hollow Fragment and has elements of the previous game Sword Art Online: Lost Song. What I noticed while playing was that there was no more auto attack. You had to input your attacks manually each time you wished to damage the enemy by pressing the square button. While there is no more auto attack, the ability to jump was added. You could jump and attack to damage a hard to reach target, including that large red gem on the boss’ chest. You still have the ability to dodge an enemy attack. This action has been moved to the R1 button. 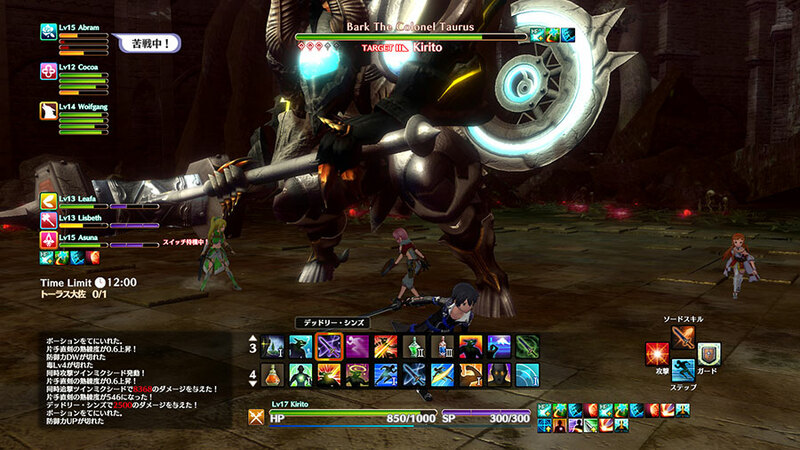 The HUD looks very similar to Hollow Fragment’s with the HP bar and SP bar placed at the bottom of the screen. At the center bottom of the HUD, the main skill palette can be reached. Here, all your skills and items are placed so if you want to use them, you control the cursor with the directional button and then select the skill or item you want to use by pressing the Circle button. 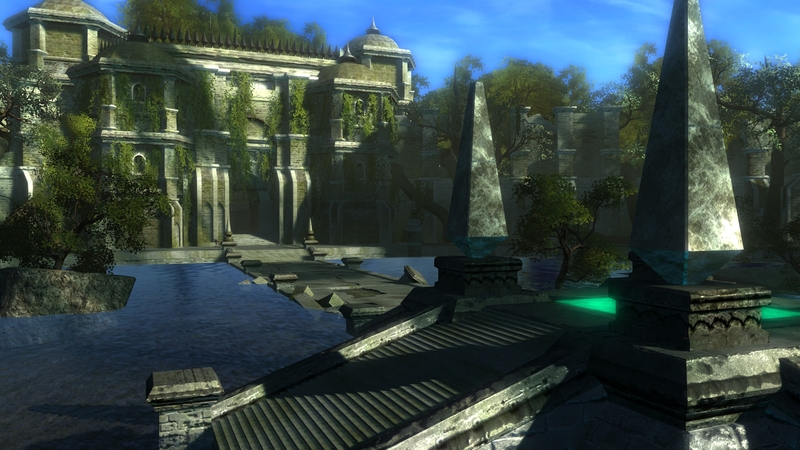 This main palette is very similar to a skill palette as seen in many MMORPGs. I found the main palette to be very useful while playing the demo. All of my skills were right in front of me and it was easy for me to select the right skill for certain situations. If there was a certain skill you liked to use a lot, then you could set it to the Triangle button. For this demo, the skill set to the button was the Sword Skill, called Horizontal. Like previous games, skills cost SP to use. For the skills used in the demo, most of them cost around 50 SP. Similar to Hollow Fragment, SP can be regenerated over time as you stand still or if you attack the enemy with normal attacks. 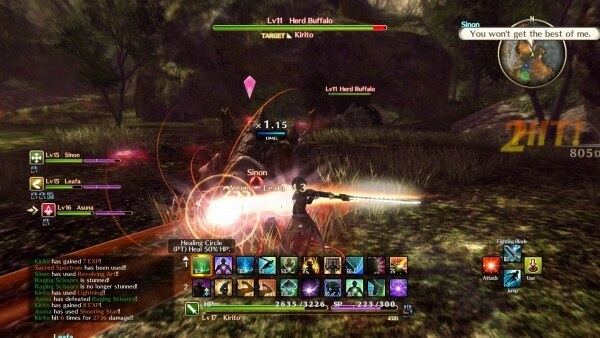 As you fight the boss, your party members will ask you to do certain actions such as heal or perform a Sword Skill. If you perform a skill at that time, then you will chain a skill with your party member. For this demo, it was usually Asuna who asked me to perform a skill with her, but that may have been just a coincidence. The boss fights are performed in a raid style format. You work with multiple NPC parties to take down the boss. 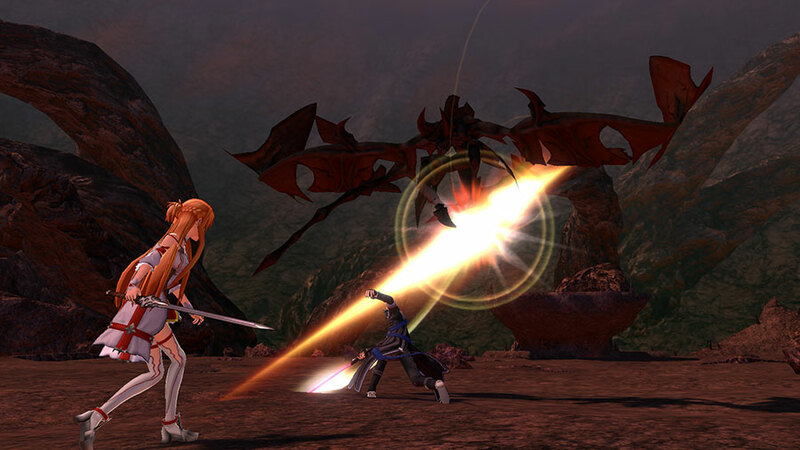 These party members will usually do their own thing during the encounter. You also have the ability to tell your party members what to do during the course of the battle, both your own party and the NPC parties. When you hold down the L1 button a sub palette shows up in the upper left corner of the screen. Here you can tell your party members what to do. You can tell them to do many actions such as target a particular body part or dodge an attack. This can be very useful if you want to keep your party members alive during a boss fight. When fighting an enemy, you can lock on to a target by clicking the R3 stick. You can also lock onto the boss’ body parts such as its legs or its tail. This can really help when you want to focus on a particular target. As you fight the boss, members from the NPC parties can be taken out. During this time, a skull will appear where they were killed. If you run to this spot and hold the Circle button, you can revive that party member. This is pretty important to do, as it is a bit difficult to kill the boss without the other parties. One of the more interesting additions to the game is a time limit for boss fights. When I fought the boss the first time I did not realize there was a time limit and time ran out on me. The second time around I was able to beat the boss with around 4 minutes left. The boss fight had a time limit of 10 minutes. I don’t know if this time limit was imposed only for the demo or if it will be featured in the full game. I found it interesting and more challenging to fight a boss with a time limit, as it was a nice change of pace from previous games. The demo was very fun and it was a challenge to keep my party members alive during the boss fight. Luckily, there’s no game over when your party members die this time like in Hollow Fragment. 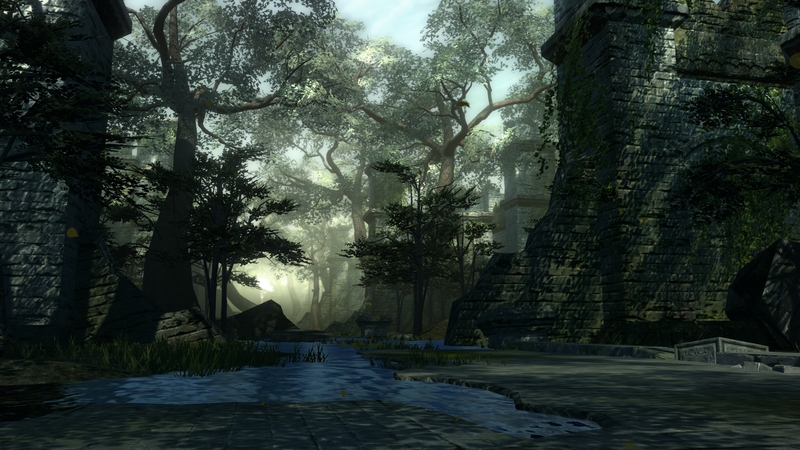 The gameplay felt much smoother and less clunky than previous games and it looks nicer than previous entries. The only problems I saw during the demo were the camera angles and the targeting system. The camera would sometimes move to a weird angle when attacking the boss. I would be unable to see my character and it would make it tough. Also, the targeting system felt weird. I couldn’t select where I would want my cursor to lock onto. I could only do that if I specifically attacked that part. Once I did that, I could lock onto that part. Other than those two problems, the game played great and I’m definitely looking forward to the full version once it releases. 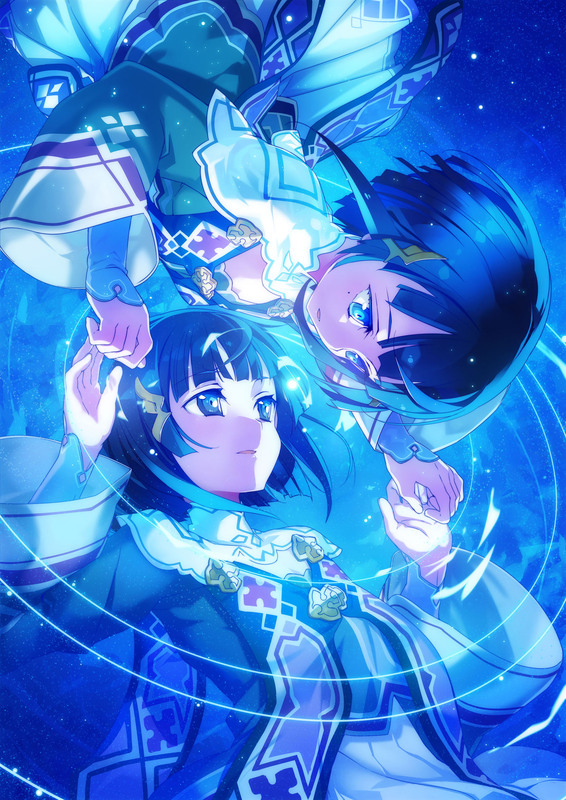 Sword Art Online: Hollow Realization is the latest entry in the Sword Art Online video game series. It is developed by Aquria and published by Bandai Namco Entertainment. It is set to release in Japan on October 27, 2016 and in North America and Europe on November 8, 2016 for the PS4 and PS Vita.